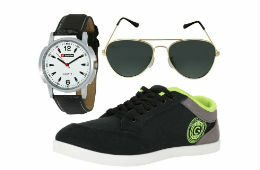 Beat the streets with carefully crafted Stumble Grey Green casual shoes for men by Globalite and Lotto Watch and Sunglass. Made from top quality canvas cloth, Globalite brings to you this comfortable and durable shoes for dailywear. Black denims and brown shoes to make all heads turn at college or wear them with casual slim-fits to work.The beauty of Globalite sport shoes translates from the fact that outstanding outside design combined with comfortable insole make each one a perfect pair.